Michigander Matt Falk will never forget his dog Logan, a Siberian Husky Falk remembers as a sweet boy and a great friend, a dog with his own unmistakable unique qualities. But in early 2012, tragedy struck. A cruel act by an unknown person left Logan gravely injured. 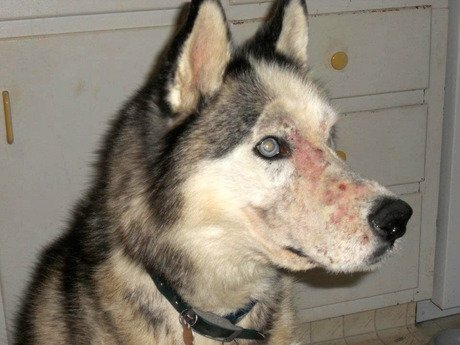 “On the night of March 12 of 2012, my Siberian Husky Logan was attacked in his own back yard, in his own kennel,” Falk writes in a Facebook post. That evening, Falk took Logan out to his kennel, where Logan loved to sleep at night. Nothing seemed out of the ordinary. But during the night, an unknown person approached the kennel where Logan lie sleeping and poured battery acid on the Husky’s muzzle. What began as a small burn on Logan’s muzzle soon spread, severely burning most of the right side of Logan’s face and around his eye. As the weeks went by after his attack, Logan received constant medical care and seemed to take a turn for the better. His face was badly scarred, but it looked like he would recover. But sadly, in the summer of 2012, the 11-year-old Husky’s body just couldn’t take the stress anymore. His liver and kidneys began to fail. “On July 9, 2012, Logan curled up at my feet & passed away quietly in his sleep. He was laid to rest under an apple tree in our yard,” writes Falk. Logan’s cruel attacker was never caught. Co-sponsored by Michigan State Representatives Paul Muxlow (R-Brown City) and Harvey Santana (D-Detroit), the bipartisan legislation in “Logan’s Law” brings to the table two important keys in curbing animal abuse in The Wolverine State. HB 4534 aims to prohibit animal shelters from selling or adopting out animals to convicted animal abusers, but it is HB 4535 that is the most revolutionary; if passed, it will establish an animal abuser registry in the state of Michigan. The registry, which would be maintained by the Animal Control Division of the Wayne County Prosecutor’s Office, would be searchable by both animal shelters and private citizens. This isn’t the first time lawmakers have tried to establish an animal abuse registry in the state of Michigan; a similar proposition failed to get approval during a committee hearing last year. But thanks to Matt Falk, who launched a social media campaign on Facebook, the call for justice has reignited interest in a searchable animal abuser registry. “Logan’s Law” was submitted to the judiciary committee for consideration April 10, and Falk says the response he’s received has been overwhelmingly positive. “Even though Logan’s attack was a terrible thing, we have a chance to turn this into something positive for animals all over the state, and even hopefully someday the whole country,” Falk says. Rep. Santana hopes to arrange a hearing date for “Logan’s Law” in the next few months, and in the meantime will continue to push for its public approval. Matt Falk and his wife, Nancy, ask in a Facebook post that anyone who supports HB 4534 and HB 4535 should email the members of the judiciary committee today. The Falks provide a list of committee members and their email addresses on the “Pass Logan’s Law” Facebook page.